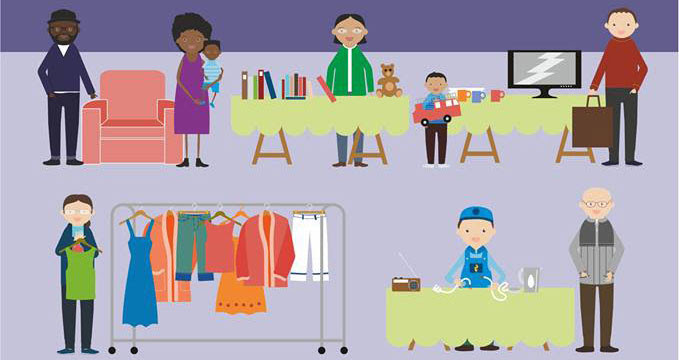 The North London Waste Authority (NLWA) in partnership with the London Community Resource Network (LCRN) are delivering a series of re-use events in North London, as part of NLWA’s waste prevention programme which promotes reduction and reuse across North London. LCRN / NLWA Give and Take Days – your chance to pass on items you no longer need and pick up something you do for FREE. Please note that you can only give: books, DVDs/CDs, garden ware, IT, tools, clothes/shoes, small furniture, small electrical items and toys. We also accept: large furniture and white goods. At the events listed below, we will also be running repair workshops - Bring your own electrical items and take part in a repair workshop! Registration on the day is on a first come first served basis. Please note - data and other sensitive information should be deleted in advance/we may not be able to repair tablets or iPads as mending them can be quite an intricate and time-consuming process. HARINGEY Residents - Saturday 24th January 2015 (14.00 to 17.00) at Hornsey Vale Community Centre, 60 Mayfield Road, London, N8 9LP. You can GIVE away your unwanted items from 14.00 to 15.45 and/or TAKE things you can use from 16.00 to 17.00. CAMDEN Residents - Satuday 31st January 2015 (11.00 to 14.00) at Kentish Town Community Centre, 17 Busby Place, London, NW5 2SP. You can GIVE away your unwanted items from 11.00 am to 12.45 pm and/or TAKE things you can use from 13.00 to 14.00. WALTHAM FOREST Residents - Saturday 14th February 2015 (12.30 to 15.30) at St Edmund’s Church, Larkswood Road, London, E4 9DS. You can GIVE away your unwanted items from 12.30 to 14.15 and/or TAKE things you can use from 14.30 to 15.30. ISLINGTON residents - Sunday 15th February 2015 (12.00 to 15.00) at the Vibast Community Centre, 163 Old Street, London EC1V 9NG. You can GIVE away your unwanted items from 12 to 13.45 and/or TAKE things you can use from 14.00 to 15.00. Copyright © 2015 London Community Resource Network, All rights reserved. You are receiving this email because you are an LCRN Member.